When you send emails you can choose the email sender between program settings or tournament setting. 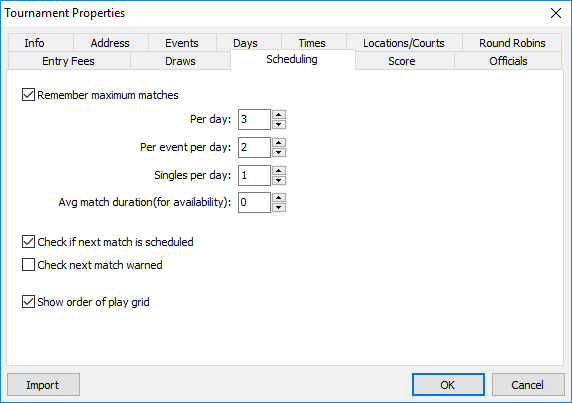 A schedule option has been added to schedule 1 match per 2 days, per week or per 2 weeks. You can directly edit a player in the player database. The schedule validation now checks for planning while a player is not available. You can disable the remarks field on the online entry form. You can hide the players during entry while publishing. In the match properties there is a button to send all players theirs match time. Each player also shows the last sent time. The schedule validation now includes multiple locations. The order of player can show a match information panel with other matches and locations for the selected players. The 'not-warned' screen includes a player search and shows more information. Also a filter has been added. The schedule settings have been moved from program options to tournament properties. 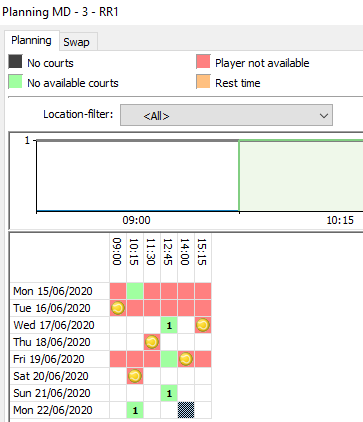 The schedule screen now shows player not-available and no-courts in a single cell as red/green. 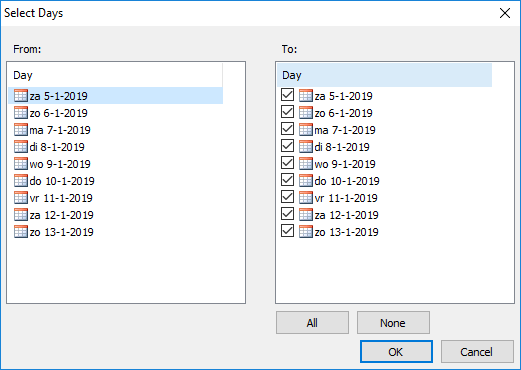 The copy times (or court availability) function has been improved and allows you to select the days to copy to. You can automatically publish results. 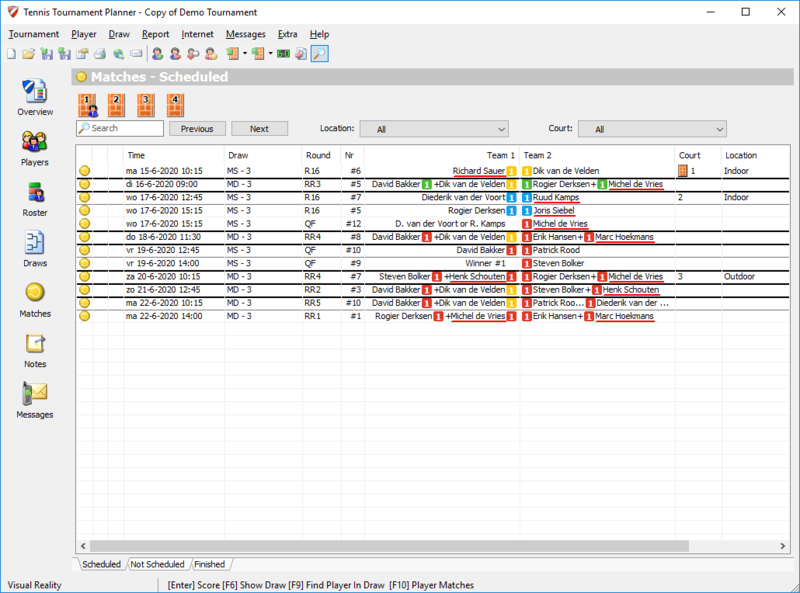 This keeps your tournament up-to-date online. You can toggle this option on the publish screen. 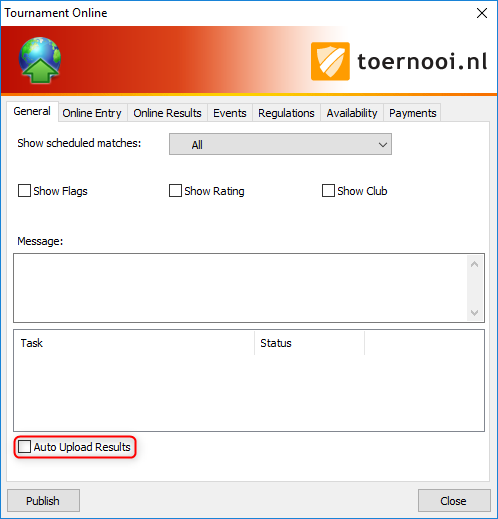 PLEASE NOTE: Only match results are automatically uploaded, if you want to publish a new schedule you still need to do this yourself. The matches screen has been updated. The text is no longer colored, which is easier to read. Instead colored status icons have been added to indicate the status of each player. You can track if a player checks in for the first time so you can hand out a welcome gift. This options can be switched on in Tournament Properties, tab Draws. You will see a '1' in the status icon of the matches screen for any player that checks in for the first time. 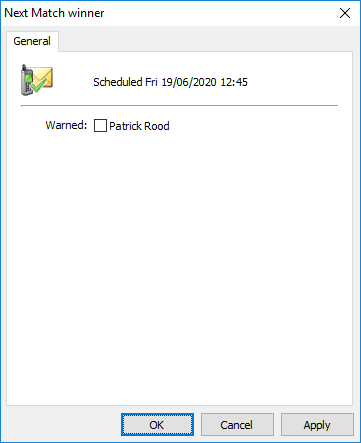 Advanced re-scheduling. 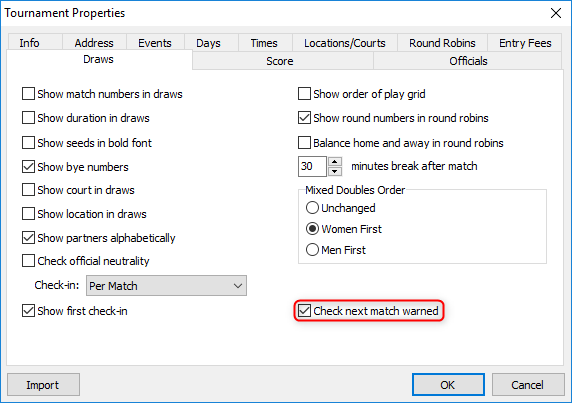 Sometimes you want to move a match to a timeslot where you have no more courts available. 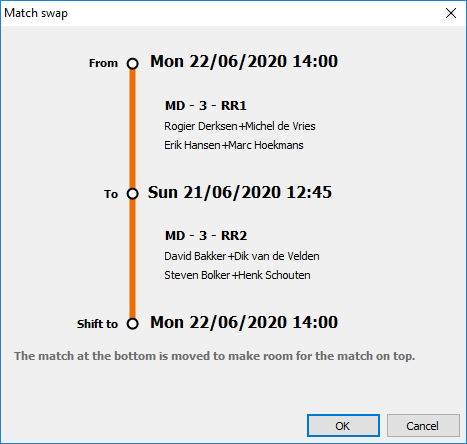 Now it is possible to see if some matches in that timeslot can be swapped with the current match, or moved to another timeslot so you can still schedule the current match at the desired timeslot. In a cell where you see a number (1 in this example) there is a match available to swap with. You can double-click the cell which will bring you on the secondary screen. There you can see the details of the available swap-options. Select the desired match and click the Switch-button. You will see a confirmation of the 2 actions to be performed at the same time. Below you see an example where 2 matches are swapped. 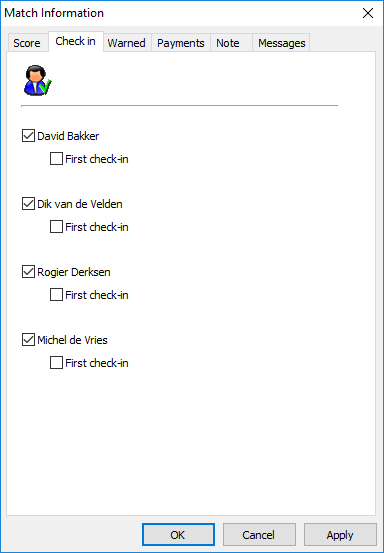 There is a new menu option: Draw- Exclude Entries. 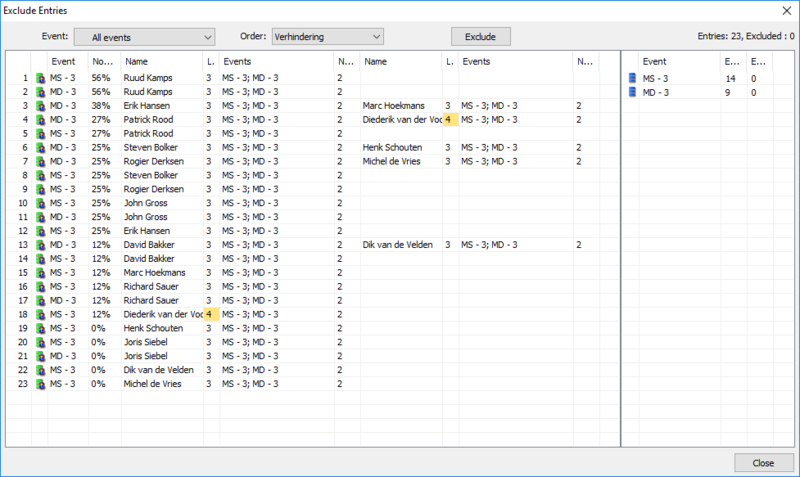 This screen will help you to exclude entries based on the number of events for each player, availability and level. On the right you can see a summary of all events. You can immediately warn the players for their next match. You can switch this option in Tournament Properties - Draws tab. 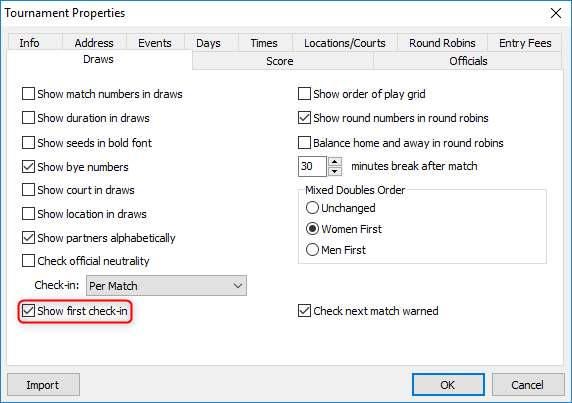 If you enter a score, and the following match is scheduled already, you can immediately record this. When scheduling multiple playoff draws there could be a situation where some player where blocked incorrectly. This issue has been resolved. A new report has been added: Draws - Round Robin Groups. This report gives you a compact list of all groups and the players.